Because food should be fun! FoodActive not only equips children and young people with the culinary skills that will allow them to cook interesting and nutritionally-balanced meals FOR THE REST OF THEIR LIVES; it also gives them a love of food, an interest of food, and it awakens their minds to the possibilities that come with living a FoodActive lifestyle. The truth is that lifestyles today are too often geared towards rushed meal times and convenience foods. 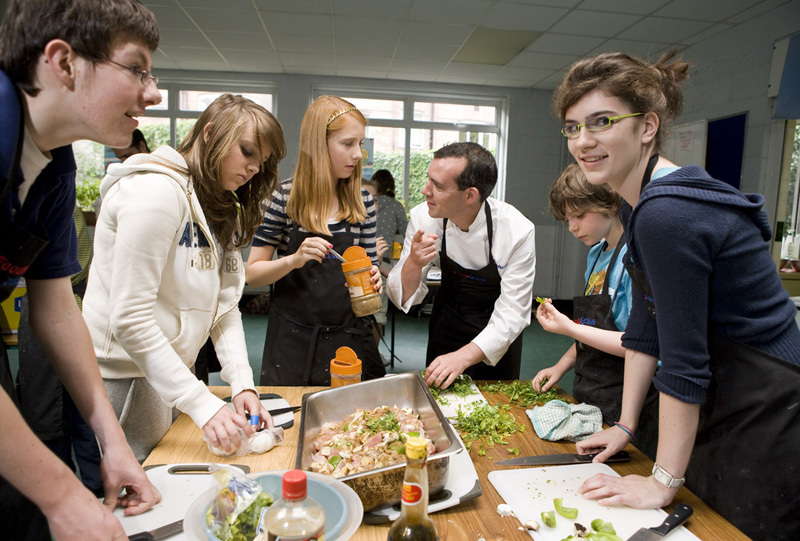 At FoodActive students can engage themselves fully in learning about food, its preparation and cooking, and the part it should play in their active lives. But food is only one part of being FoodActive. The sporting and activities programmes at FoodActive allow students to experience firsthand the relationship between exercise, a balanced diet and a healthy lifestyle. And did we mention that sports are also great fun..? Of course, there is also the social aspect. The young people who take part in the summer camp get to meet new friends from other schools, and the carefully crafted activities allow then to learn the value of teamwork in an enjoyable and relaxed environment. And that’s what being FoodActive is all about. Eating is one of the great pleasures in life, but, as everyone knows, there are consequences to eating too much, or eating the wrong type of food. Your body is a system, and it contains many different elements, including carbon, calcium and iron. We need to replenish these elements regularly in order to stay healthy – and we do that largely through our diet. Most of us know intrinsically what is good for us and what is not so good, but do we know why? And we know that food is fuel for the body; but do we really know what that fuel is doing? For example, did you know that proteins are for growth and repair – for enzyme and hormone production? You might have some idea that we get the majority of our energy from carbohydrates, but did you know that they are also essential for bowel health? Did you think that all fats were bad, or were you aware that fats are an essential part of your diet, crucial for heat and energy storage and for membrane formation? And did you fully appreciate the power of vitamins and minerals. Did you realise what even tiny amounts of these special components could do for your vision, your bone growth, your skin, your blood and your nervous system? Did you know how important they were in terms of disease prevention, blood formation and the maintaining of the fluid balance in your body? There is a huge amount of science surrounding what we eat, but it’s important to remember that FoodActive is not a science class! Our course does, however, give children a good grounding is what is good for them, and why. It teaches them about a balanced diet, and lets them know, in a practical, fun and hands on way, what foods exist in what food groups. But perhaps most importantly, through our cookery classes, it teaches children that healthy foods can also be interesting foods. It teaches them that healthy foods can sometimes be fast foods. It teaches them that healthy foods are fun to prepare. And it teaches them, above all, that healthy foods can be as delicious and satisfying than any of the convenience foods that could, if left unchecked, form the majority of their diets. Healthy eating is hugely important if we want to lead a healthy life. But healthy eating works best in tandem with an active life. This is where the “active” part of FoodActive comes in! FoodActive is the perfect antidote to sedentary modern lifestyles. We’re not trying to produce the next Brian O’Driscoll or the next Derval O’Rourke (although if a future Irish sports star happens to take part in one of our programmes, we may feel a tiny sense of pride in about 10 years…) Instead, FoodActive is trying to promote healthy lifestyles through the combination of great food, great cooking and lots of activity and exercise. All your favourite sports will be available at FoodActive, whether you love soccer, basketball, tag rugby, table tennis, rounders or simply taking part in an invigorating hike. The focus at FoodActive is not on competition. Rather, it is on fitness, health and team building. And these are some of the most important lessons that we can learn from living an active – indeed, a FoodActive – life.